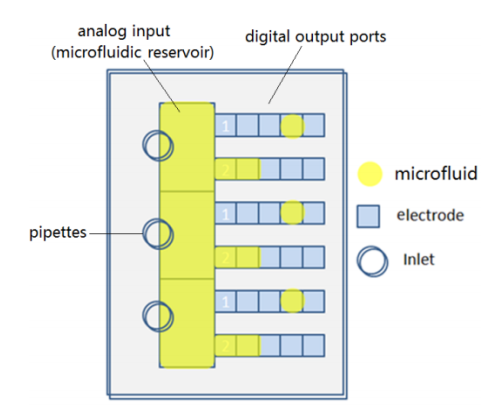 In the field of MEMS and lab-on-a-chip devices, microfluidic biochips don’t require a lot of power or sample volume to operate. They are also relatively cheap, offer a fast response time, and are overall highly efficient. 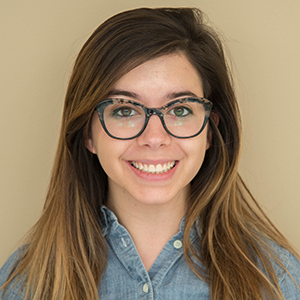 Another great advantage is their ability to integrate operations such as detection, sample pre-treatment, and sample preparation onto a single chip. Microfluidic biochips are used in a wide range of applications, including inkjet printer heads, micro drug delivery systems, and DNA and clinical pathology devices. Analog, which handle continuous flow. Digital (DMFBs), which rely on electrowetting-on-dielectric (EWOD) techniques to drive droplets to move, merge, split, or be manipulated to perform other functions. Generally, microfluidic samples are continuous flow, such as drops of blood or saliva for diagnostic tests. This leads to two problems: You cannot control the droplet volume and the excess liquid can’t be removed in the case of overpressure on the device. In cases like these, for analog microfluids to be processed by a DMFB, an analog-to-digital converter (ADC) is needed on the device. ADCs are microfluidic dispensers that can dispense manipulated droplets from continuous flow or a reservoir of the sample. These devices are fundamental for integrating analog and digital microfluidic biochips into a mixed-signal microfluidic device. Surprisingly, there is not a great amount of research on integrating an ACD into a microfluidic biochip design. Answering the call, a team of researchers from the University of Bridgeport in Connecticut set out to design and simulate a high-throughput microfluidic droplet dispenser as an analog-to-digital microfluidic converter for use in lab-on-a-chip (LOC) applications. A schematic of a microfluidic droplet dispenser. Image credit: C. Jin, X. Xiong, P. Patra, R. Zhu, J. Hu, University of Bridgeport, Bridgeport, Connecticut. Taken from their COMSOL Conference 2014 Boston paper submission. The research team aimed to understand the mechanism of a high-throughput droplet dispenser as well as verify its function as an interface between analog and digital microfluidic biochips on an LOC device. First, they used the Laminar, Two-Phase Flow interface with the level set method in COMSOL Multiphysics to simulate the droplets as they move and split in the dispenser by simulating the electrowetting process. 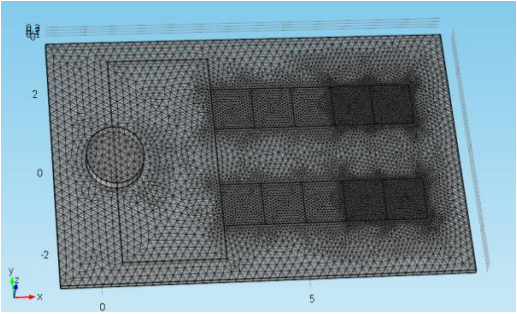 This was done to better understand microfluidic behavior in general and analyze the time settings needed for the next phase of the simulation. 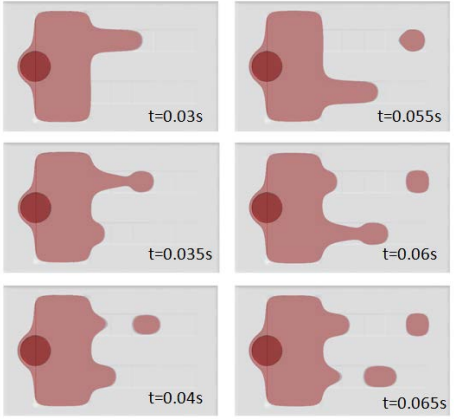 The researchers were also able to calculate the force needed to move the droplets, evaluate the droplet shape and movement, as well as analyze the voltage needed to cause their movement. Simulating microfluidic droplets in a dispenser as they move and split. Image credit: C. Jin, X. Xiong, P. Patra, R. Zhu, J. Hu, University of Bridgeport, Bridgeport, Connecticut. Taken from their COMSOL Conference 2014 Boston paper submission. Next, the team simulated the droplet dispenser as an interface between analog and digital microfluidic flow. To reduce simulation time, only two digital output ports were included on the model. With COMSOL Multiphysics, the team easily selected mesh elements to create a finer meshed model of the droplet dispenser. A meshed model of the digital droplet dispenser. Image credit: C. Jin, X. Xiong, P. Patra, R. Zhu, J. Hu, University of Bridgeport, Bridgeport, Connecticut. Taken from their COMSOL Conference 2014 Boston paper submission. 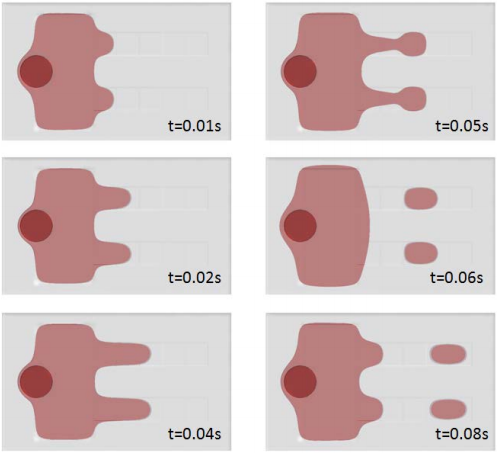 The behavior of the droplets in the output ports was simulated in both alternate and parallel modes to analyze the efficiency of each method. 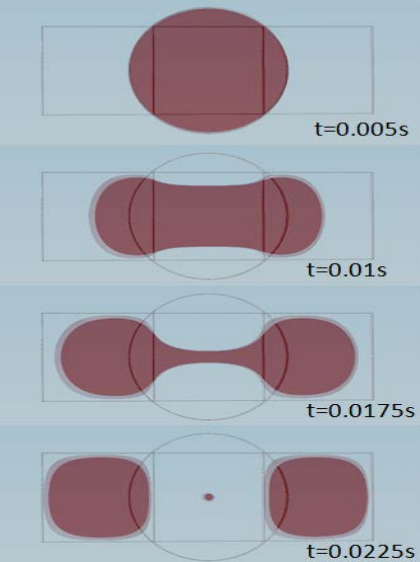 Simulating the parallel (left) and alternate (right) modes of a droplet dispenser allows researchers to analyze the behavior of the device. Image credit: C. Jin, X. Xiong, P. Patra, R. Zhu, J. Hu, University of Bridgeport, Bridgeport, Connecticut. Taken from their COMSOL Conference 2014 Boston paper submission. After simulating the droplet dispenser, the researchers verified its function and further concluded that dispensing the droplets in both alternate and parallel modes works effectively for integrating analog and digital microfluidics on a single lab-on-a-chip device. Hopefully, this research will inspire more improvements to these devices, advance the field of microfluidics, and in turn improve clinical diagnostics and other applications. To learn more about the digital droplet dispenser, download the paper and presentation from the COMSOL Conference 2014 Boston: “Design and Simulation of High-Throughput Microfluidic Droplet Dispenser for Lab-on-a-Chip Applications“.